This digital era has transformed how people do business. Whether you are a creative agency or a freelancer, having a platform to show your creations is a must. The more online visitors see your works, the more chances you have to turn them into potential customers. Picking WordPress as your preferred platform for porfolio website is a great choice. WordPress is powerful, easy to use and flexible CMS. With WordPress, you can manage your portfolio with no sweat. However, WordPress alone may not be enough. If you want to take your portfolio to the next level you will need a good WordPress portfolio theme. There are thousands of WordPress portfolio themes you can choose and it can be hard to pick the one that fits you. But don’t worry, we did the hard work for you. Our WordPress experts and in-house design team have handpicked 10+ best free and paid WordPress portfolio themes for you. Ignis does a great job at presenting you to your website visitors. When visitors come to your website, the first thing they see is a full-width image with a bold description of your website. It may seem trivial, but this feature helps you create a memorable impression for your visitors. They may have explored your competitors’ website but this layout will help to make them remember your website and your works first. Although it is a free theme, Ignis is bundled with remarkable features. For example, you can organize and manage your projects easily with Jetpack’s Portfolio custom post types. Also, customize colors and fonts the way you like by applying Google Fonts. We promise that Ignis theme options will be easy to understand even for novice WordPress users. Ignis is a powerful and free WordPress portfolio theme with flexible functions. This what makes Ignis appear in the top of our list. 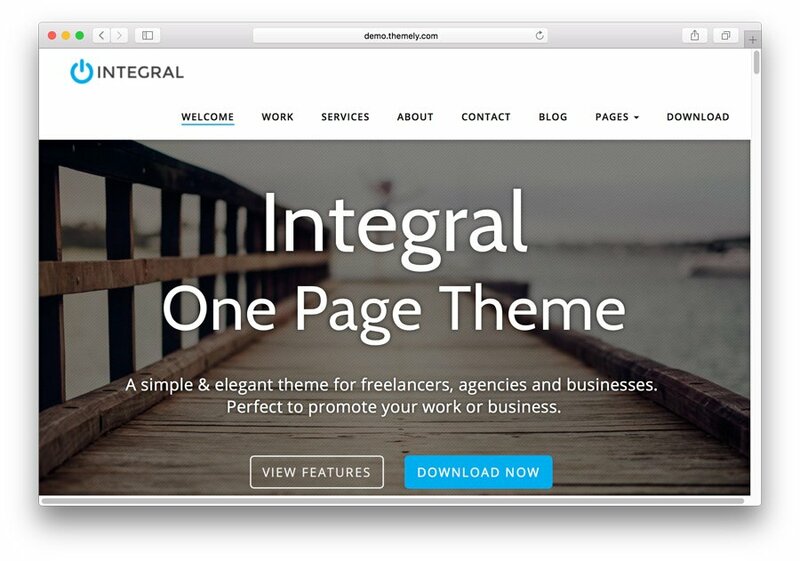 Unlike Ignis, Integral is a one page WordPress theme. That doesn’t mean, you cannot arrange your portfolio amazingly. This one-page theme will help your visitors to find all of the information they need in one just scroll. Integral allows you to customize your portfolio website the way you like it. You can change colors, headers, and menus effortlessly. If the customization is not worth your time, simply switch it into the dark or light mode. Online shop integration can be done easily as Integral fully supports WooCommerce plugin. You can also attach various widgets such as sticky post, comments, and translations in the right bar. Photomania will fit all photographers’ needs. The combination of an immersive layout, a modern touch, and responsive design turn Photomania into the favorite WordPress portfolio theme for photographers. Photomania is highly customizable. You can easily add your personal touch to make it even more eye-catching. Make sure to give the same touch to the logo color and dominant color of the themes to match it with your own branding. The personalized menu is also a helpful feature and will allow your visitors to navigate easily. 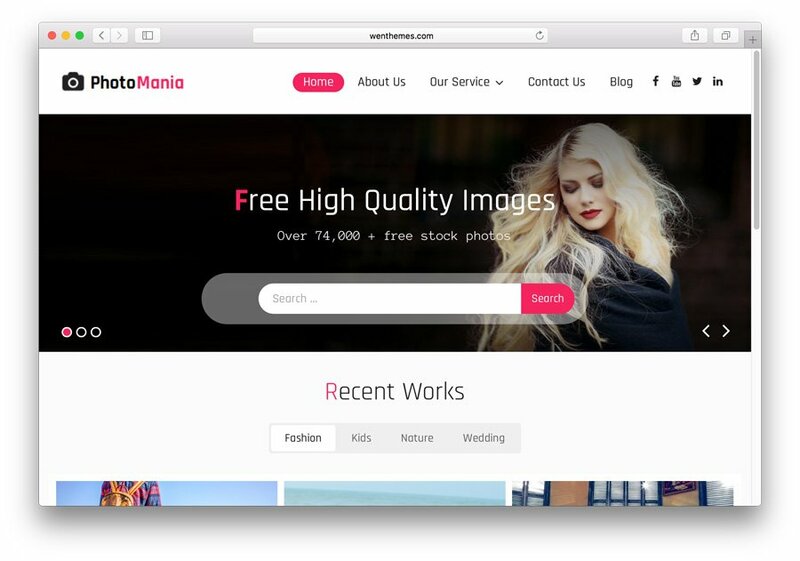 In short, using Photomania as your theme is not only giving you the best platform to display your works but also adds an engaging user experience. Simpler is often better. Automattic, the company behind Espied, knows this and successfully created a simple yet impressive theme. 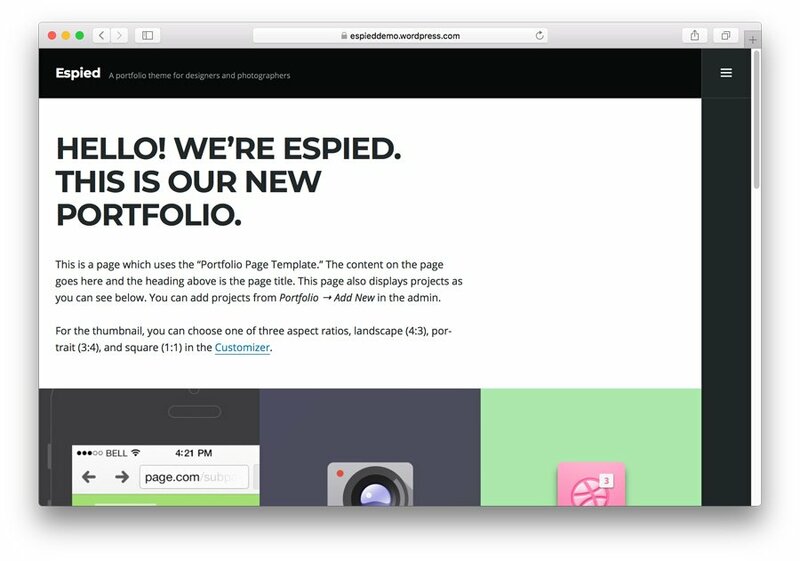 Espied makes sure your works are the focal point of the website. Theme presents a captivating grid layout to expose your portfolio and artwork. Once your visitors land on your homepage, they will be impressed by nothing but a parade of your stunning works. The great things about this theme don’t stop there. Theme customizer will empower your website with personalized color schemes, layouts, and Google fonts. Whether you are a professional content creator or a creative agency, this theme will make your content stand out. To provide a great presentation, Wallpress uses a newspaper layout. The creator behind Wallpress recognizes social media as the most successful marketing channel. Therefore, this theme will help you sync your website with all your social media accounts. Once you do a content or portfolio update, the website will make sure that your followers on social media will be notified about it. What about customization? Don’t worry. You can change the appearance easily. Colors, fonts, logos, and backgrounds are all adjustable. If the portfolios above are too specific or not flexible enough try AccessPress Lite. We recommend AccessPress Lite because of the variety of templates. AccessPress Lite hosts beautiful templates for different business such as health, travel, photography, creative agencies, and so on. AccessPress Lite is based on CSS3 and HTML5. So, this theme is compatible with every device and browser. This theme comes with a slider as a powerful feature to attract customers. Moreover, it offers various layout options to suit your website’s needs. AccessPress allows you to personalize your logo, favicon, color scheme, and so on. Beside its beautiful design, AccessPress comes with integrated plugins. Since this theme is fully compatible with Contact Form 7, you can add a contact form to your page easily and make it easy for your potential clients to reach you. AccessPress Lite is also translation ready. We know that creating memorable experiences and wowing visitors is always on your mind. Here’s the secret: you have to stand out of the crowd. You need more than a beautiful website – you need a unique website. If an exceptional portfolio theme is your priority, we recommend Pinbin. Pinbin is one of the best WordPress portfolio themes with a unique appearance. Inspired by Pinterest’s interface, Pinbin comes with a board-like background. Just like Pinterest, your portfolio will be displayed like notes pinned in the board. With the support for powerful plugins such as Yoast SEO, Jetpack, and Contact Form 7, Pinbin is a must try WordPress portfolio theme. There are artists, interior designers, curators, photographers who have wonderful artwork but don’t have any technical skills required to build a website. Perfect Portfolio is made as the solution to their pain points. With Perfect Portfolio theme, you don’t need to be a code ninja to have a beautiful Portfolio website. Perfect Portfolio is equipped with a lot of powerful features. For example, this theme is SEO ready out of the box. Perfect Portfolio will help to manage and set up a good SEO framework and will help to optimize your website’s speed. Need an online store? Say no more. Perfect Portfolio is compatible with WooCommerce – the popular online shop plugin for WordPress. Perfect Portfolio is one of those free WordPress themes that come with premium features. If you consider yourself as a WordPress beginner and need custom made features, you should put this theme on your list. 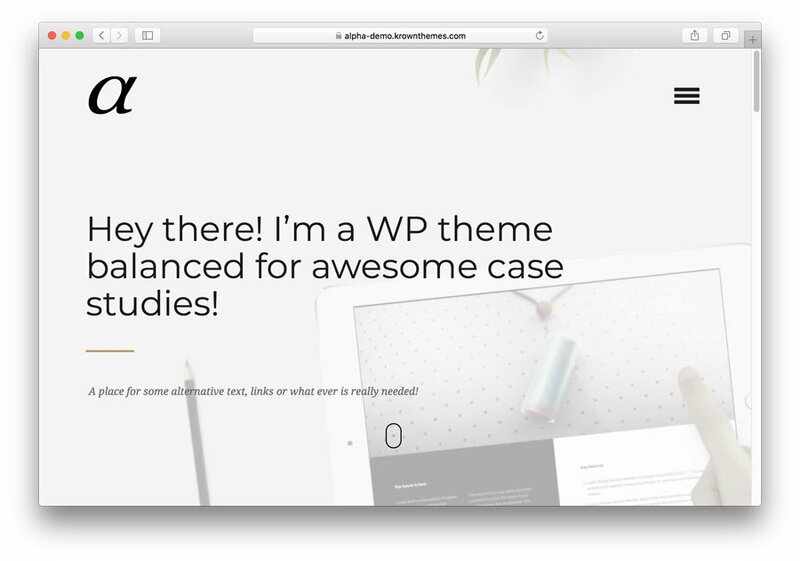 Different from most WordPress portfolio themes that prioritize images and artworks, Alpha is designed for those who want to host case studies. We have three words that best describe our first impression of Alpha: minimalist, clean, and professional. Its minimalist and clean look might be considered plain for some people, yet a minimalistic and clean touch always comes along. 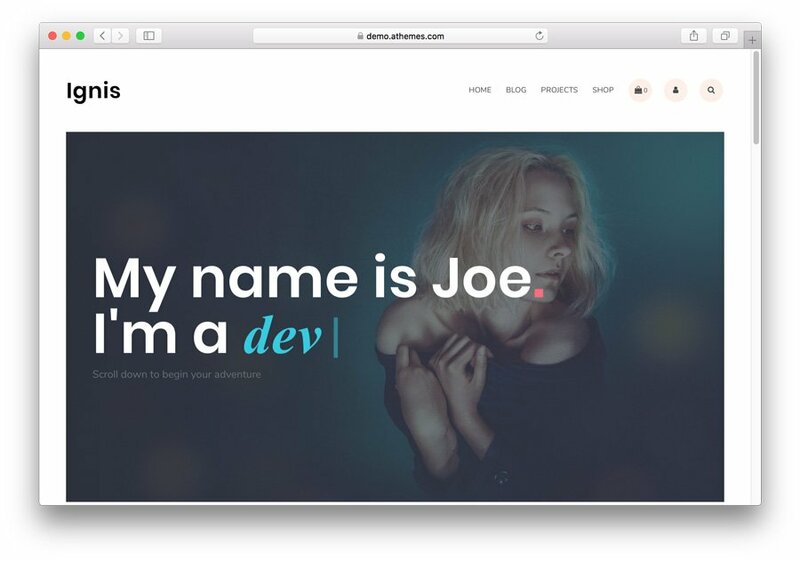 Alpha is created with HTML5, CSS3, and AJAX. Thus, this theme not only looks compelling but also loads fast and looks great on all browsers. Just like other premium themes, Alpha provides helpful online documentation. Once you buy Alpha, you will get tutorial videos and other detailed documentation to help you with the theme. 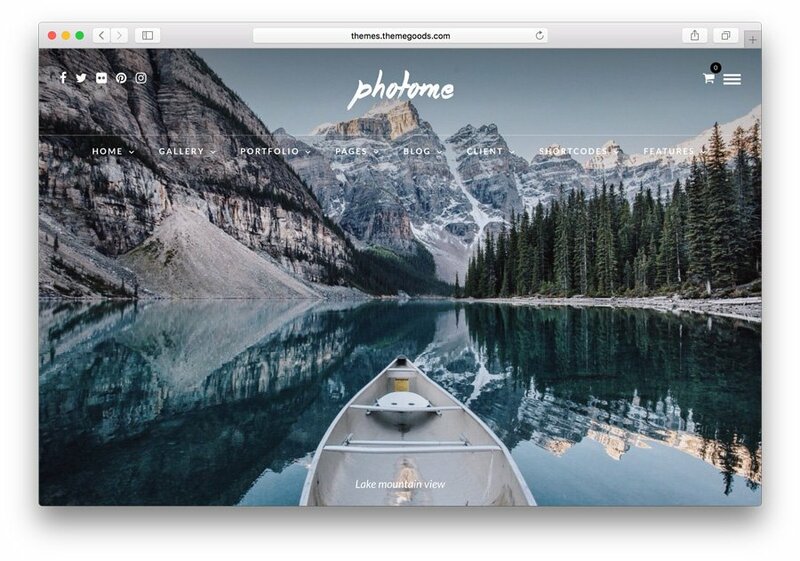 If you’re a photographer, Photo Me may be the best premium WordPress portfolio theme to show your artwork. Since photos are the point of interest, Photo Me provides more than 50 portfolio layouts. We believe that at least one of the layouts will be a great fit for you. Photo Me’s customization is another great thing. Photo Me is equipped with a drag-and-drop page builder which will help you to customize your website easily. This theme also gives you four header options, so you should never worry about having a mainstream website. The customization doesn’t stop there. Photo Me developers, ThemeGoods, made it possible to change the color of any element with color picker. Regarding typography, you can choose over 500 Google Fonts. Photo Me also supports various powerful plugins such as WooCommerce. With WooCommerce support, you can turn your website portfolio into an online store. Your customers can find your artwork and buy it directly from your website. Photo Me is bundled with eight demos. You can import all of the demos with a single click. 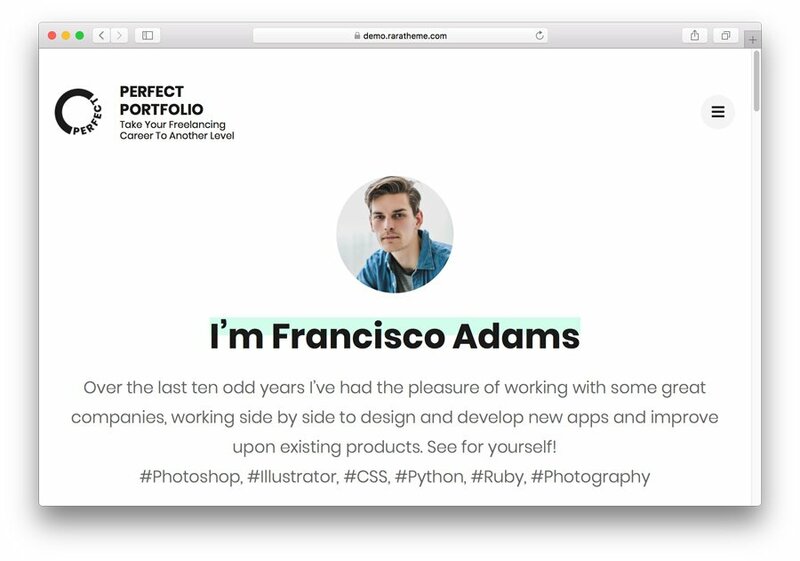 Want to build your portfolio website fast? Say no more. Take Crane with you and get everything you want. 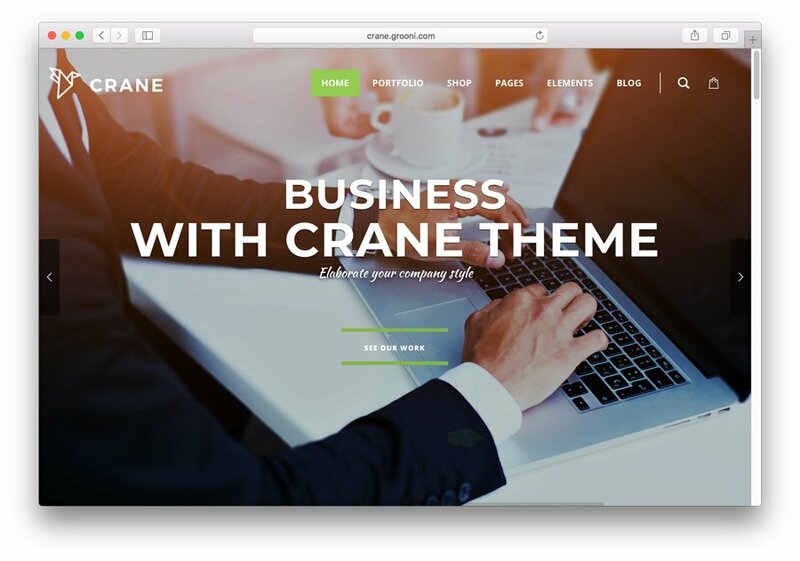 Crane is beautiful, engaging, multifunctional WordPress theme you can use to create a great portfolio website. With Crane, you will get demos and tons of pre-built elements. Crane comes with 7 integrated premium plugins: WPBakery, Slider Revolution, LayerSlider, ConvertPlus, Ultimate Add-ons, Massive Add-ons, and Groovy Menu. Intended for non-technical users, there are 150+ demo pages in this theme. If you don’t want to spend a lot of time designing your web, you can pick one that suits your business best. Crane also comes with a visual builder. 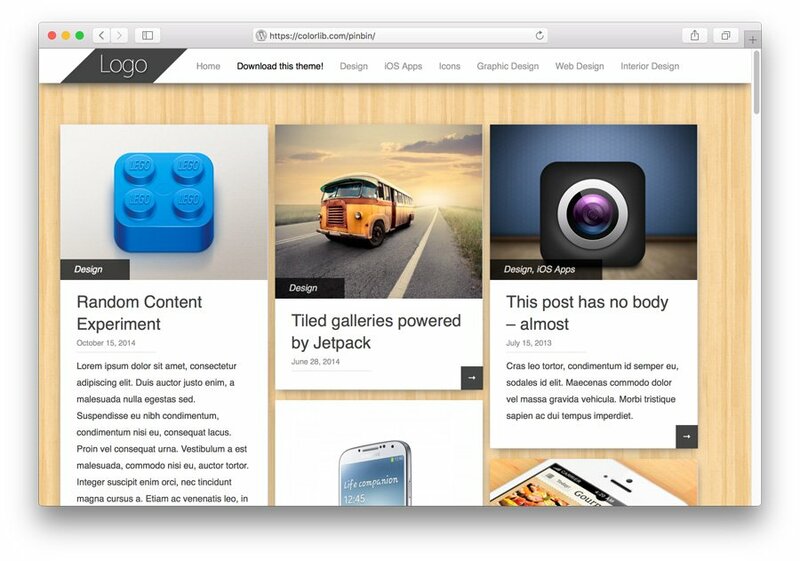 You can drag and drop elements to build your website. You can also customize your sections and layouts. Don’t worry, the customization can be done in a few clicks. Need a more sophisticated design to wow your visitors? Crane provides 25 clipart images and 2,000 icons. You can also customize the background. Crane will certainly help you to have fun exploring your website’s style and design. Despite having so many features, Crane is still lightweight and loads quickly. Impressive! While other themes compete with each other to get the most unique interface, Arnold keeps its simple, minimalist, clean, and professional. 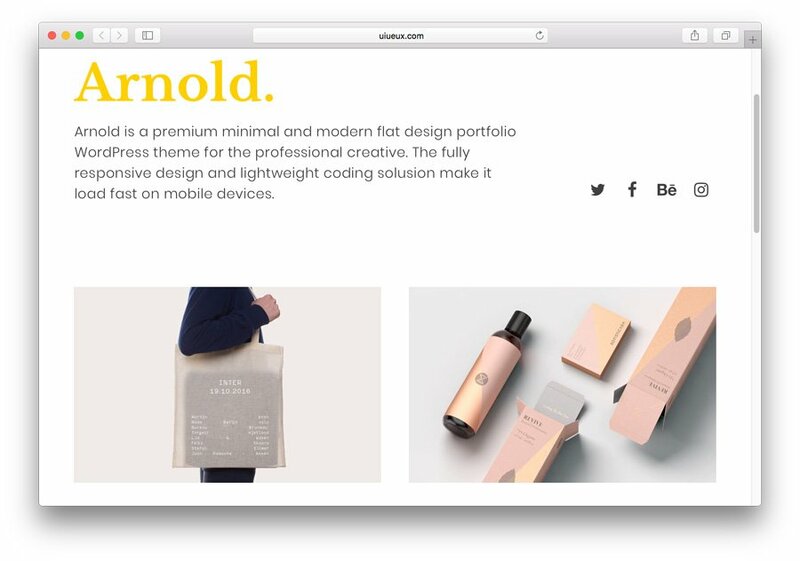 Combining modern and minimal flat design, Arnold will help you to steal the limelight. If you want your artwork to stand out, we recommend you to take Arnold with you. Arnold is fully responsive and works without issues on most browsers. If you love making improvements to the code, you will be happy to know that Arnold comes with a light coding structure. However, if you don’t want to code, Arnold comes prepared with 9 demos and 7 header options. How Arnold will display your portfolio? The template gives you full rights to make unlimited layout changes. Its custom portfolio builder is what makes this possible. Arnold is also packed with Google Fonts and Icon Fonts plugins. The abundance of choice will surely help you develop immersive posts and pages that suit your branding. Arnold utilizes the power of social media for marketing. Get social media elements such as a sharing buttons, post buttons, integrate social networks, and so on. Imagine the situation. You’re a freelancer who is looking for your next project. Every time you reach out to the project owner, you will need to send your CV in a pdf via email. With WordPress, you have better options to show yourself to the world. Get a website that highlights your resume and your portfolio. 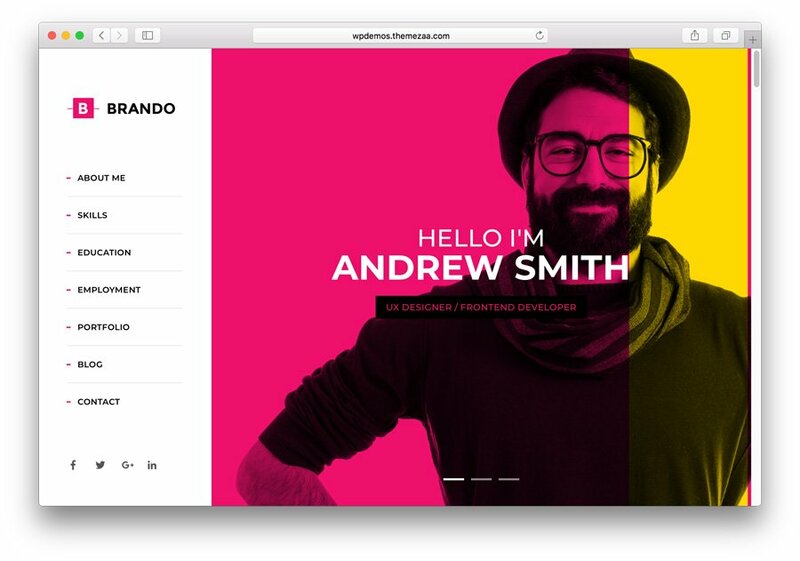 If you are a freelancer, we suggest you to pick Brando as your WordPress portfolio theme. Brando is developed to empower creative individuals and let them build their own one-page website easily. Show your resume, work, and achievements effortlessly with Brandon! With technologies such as HTML5, CSS3, Bootstrap, and jQuery, Brando will help you create the most sophisticated online resume and portfolio website you’ll ever see. Divi is powerful, light, flexible, and mobile-friendly multipurpose WordPress theme. You can use it to create any kind of website including portfolio. 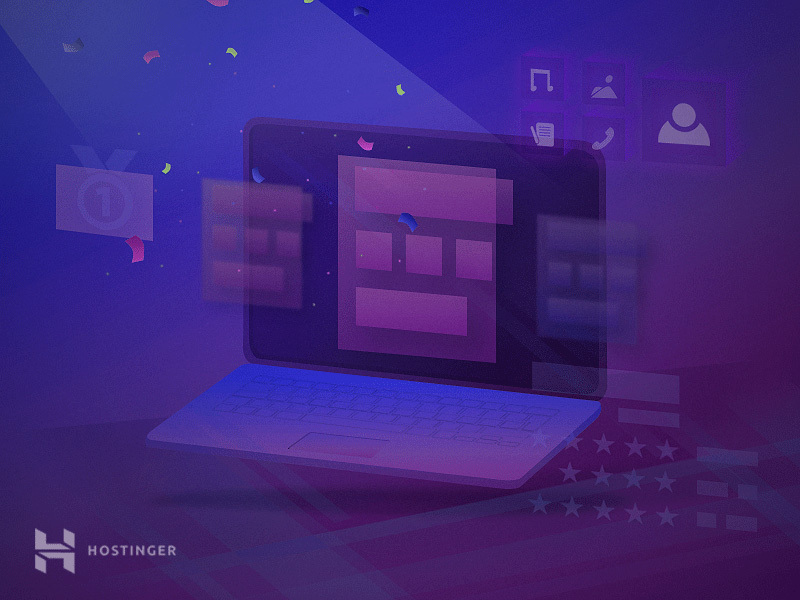 Its page builder will transform the way you develop your online portfolio. Let’s dive deep into its wonderful page builder. 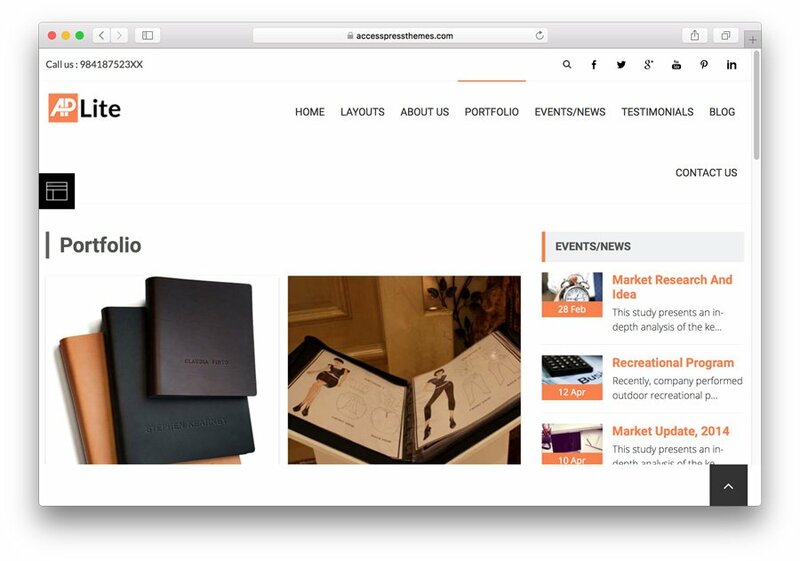 First, it provides the ability to design a portfolio page in real-time. This means you can see what you are building. With Divi, you don’t need to open the settings panel or include custom CSS rules anymore. Everything can be done by inbuilt drag and drop builder. 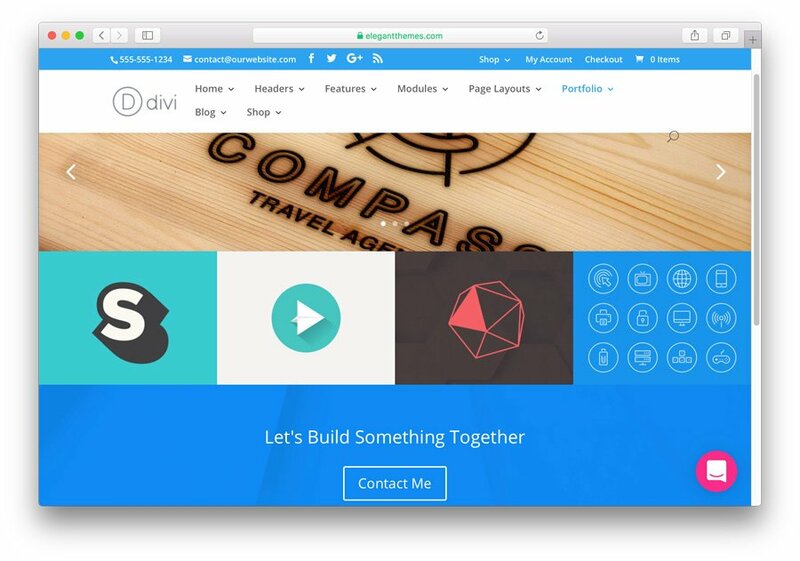 In addition, Divi gives you 46 elements that you can personalize. If you don’t want to spend your time building a website, Divi offers you 20+ beautiful layout templates. With WordPress portfolio themes you have the ability to build a portfolio page that suits your needs. In the ocean of free and premium WordPress portfolio themes, our experts have lent a helping hand and picked the best themes. Now, it is your time to pick one and start your online journey.